Pierced brass "lacy" two-arm sconces in a pair. Very well-made hand-hammered and cast elements. Wonderful pierced decorative backs. Dating to the late 19th or early 20th centuries. Unwired, but can be wired for electricity for an additional cost. Sold together as a pair for $1,600. Subtle, faded natural patina. Unwired, but can be wired for electricity for an additional cost. Single Murano two-arm sconce newly wired for use within the USA. Vintage clear glass sconce includes back plate. This two-arm brass sconce features 30 elegant hanging crystals and a winding floral design. The lovely brass finish perfectly contrasts the shimmering luminosity of the crystals. French 1940s brass two-arm wall sconces with diamond form and scrolling backplate and amber glass scalloped top shade. Italian 1940s brass and ebonized wood two-arm wall sconce with amber Murano glass bowl shades with scalloped top. Pair of French Art Nouveau brass two-arm wall sconces with fleur de lis front panel and white scalloped glass shades. 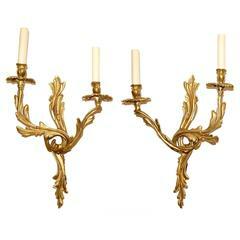 A pair of circa 1920s French Louis XVI style gilt bronze 2-light sconces. Measurements: Height 21" Width 12" Depth 5". Pair of French, 1940s brass two torch form arm wall sconces with original brown upholstered conical form shades.